If you’ve followed FiberArtsy for a while, you know that over the years, I’ve explored lots of techniques for dyeing different yarn colors and patterns. 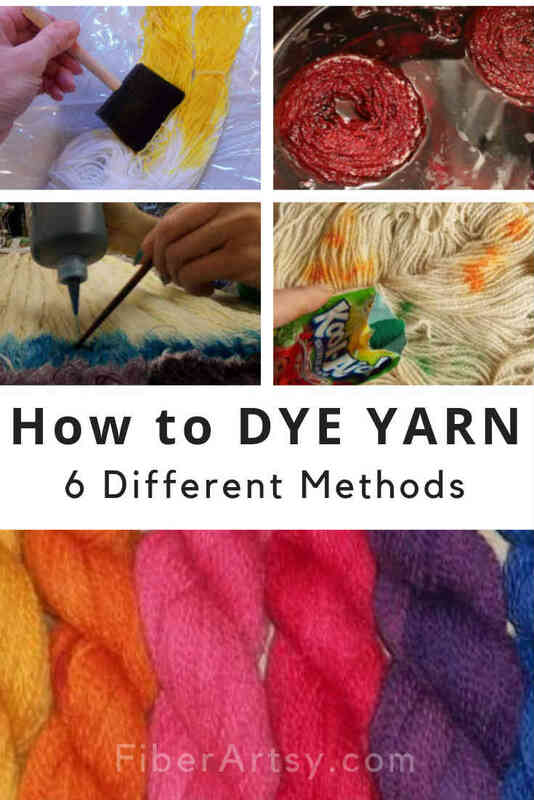 There are many, many ways of how to dye art yarn and each hand dyer has his or her own unique process. 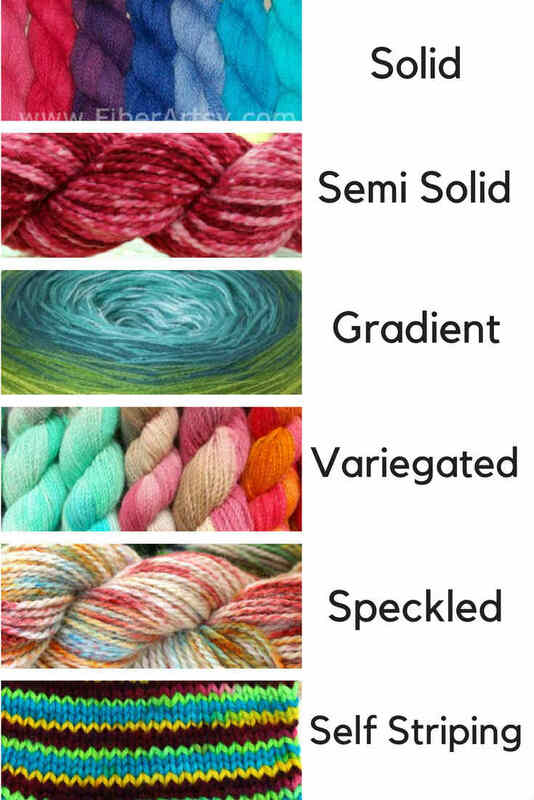 Here, I am sharing with you basic yarn dyeing methods to achieve 6 distinct color patterns: Solid, Semi-Solid or Tonal, Gradated or Ombre, Variegated or Multi-Color, Speckled or Sprinkle Dyed, Self Striping Yarn. This means exactly what it sounds like: a skein of yarn that is one solid color. This is typically done with the immersion yarn dye method. The tricky part of immersion dyeing is getting your yarn to take up the dye evenly. It requires moving the skein around in the dyepot which, if not done carefully, can result in felted yarn. It just occurred to me that I don’t have a tutorial for immersion dyeing. I’ll work on that. Presoak your yarn in a warm water/vinegar mix. Mix up your dye according to manufacturer directions. Fill your dyepot with water the same temperature as the soaking water. Add the liquid dye and stir. Carefully add your skein of yarn and raise the heat to an easy simmer. Very gently stir the yarn in the dye pot. You have to move it around to get an even color but you don’t want to move it around so much that it causes the yarn to felt. Let it simmer until the dye is taken up and the water is clear. 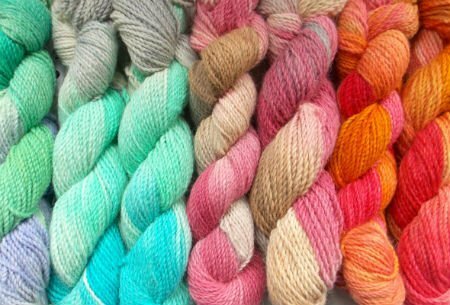 Semi Solid or Tonal Dyed Yarn is yarn that is dyed with various strengths of the same color. Some areas are lighter and some are darker with stronger tones of the same dye color. This gives the yarn a mottled or marbled look which adds more interest to a knit or crochet piece than a solid dye color. 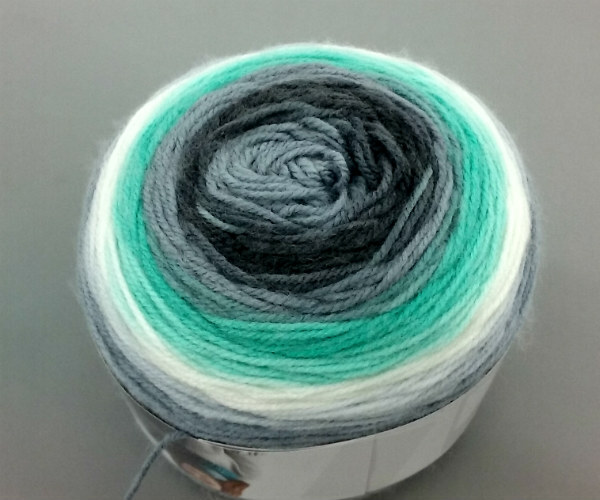 You can achieve a Semi Solid or Tonal Yarn with a variety of methods. One way is to pour the liquid dye directly on several areas of the soaking yarn and allowing the dye to disperse. As it flows away from the original dye spot, it naturally dilutes and therefore lightens the color. Gradient, Gradated or Ombre Yarn is dyed with a color gradually changing from lightest to darkest. This can be done with one dye color across the entire skein or it can also be one color gradating to a different color. There are several methods for achieving a gradated or ombre yarn. You can set up bowls or mason jars with different dye strengths from most diluted to full strength. Then soak equal sections of yarn in each. Another way is to dip a full skein in a dye pot and then gradually lift out sections of the yarn. Sometimes also called Space Dyeing, this dye method means pretty much what it sounds like … yarn dyed with multiple colors. These can be dyed in a pattern s.a. repeating stripes of the same colors or the colors can be randomly placed along the skein. If you want your yarn to have a pattern of repeating the same colors, you can use the Hand Painting Method. This technique gives you precise control over the placement of the various dye colors. If you want your yarn to have random areas of various colors, use the Kettle Dyeing Method. This gives you less control over the placement but the dyes move and blend in surprising ways for more variety. 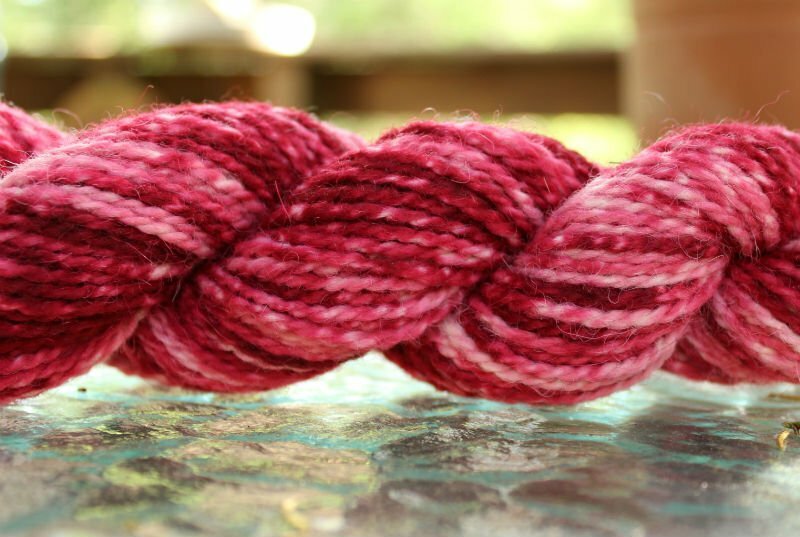 This type of dyed yarn has been super popular in the past few years. Speckled Yarn means just what it ways: yarn that has spots speckled or sprinkled onto it. The base color can be anything from solid to multi colored. 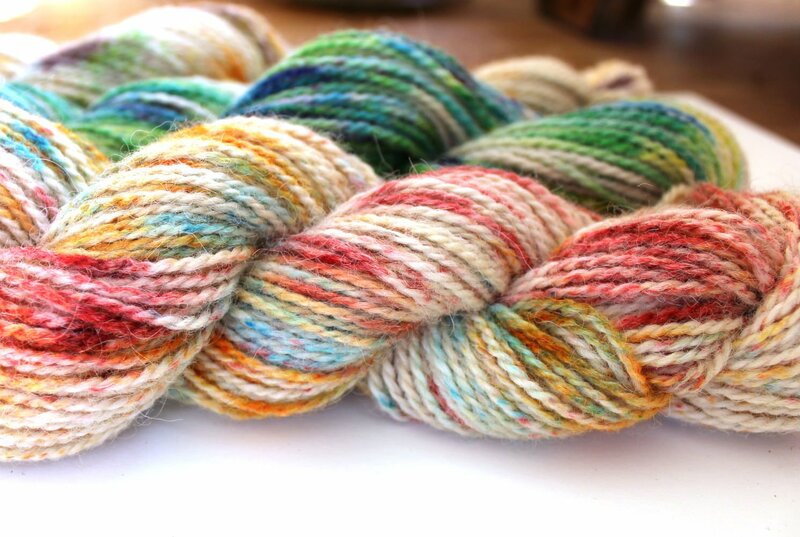 The focal point of speckle dyed yarn is the little pops of color which again, can be one color of specks or many different dye colors. The ‘sprinkles’ also show up nicely in the finished knitted or crochet project. The speckle dyeing method is really very straightforward but it does take some practice to control the dyes. Too much dye and you have a big blob of color, too little, and it barely shows up. 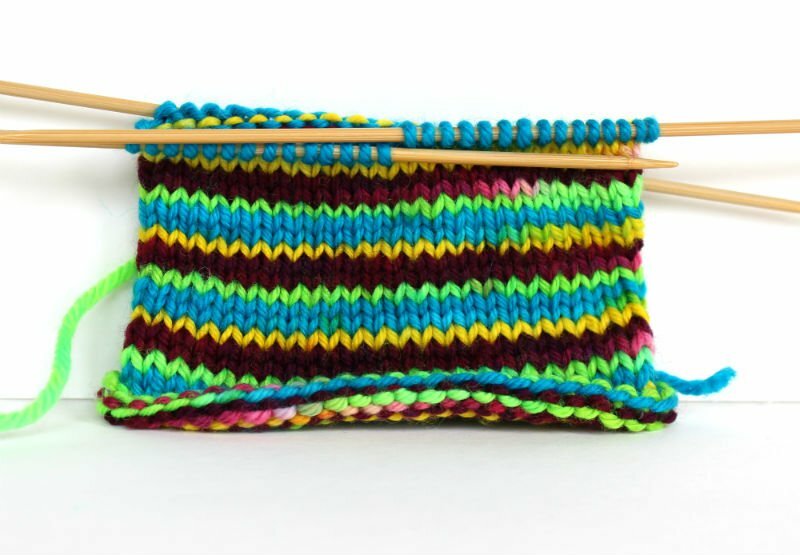 Self Striping Yarn is yarn dyed in long sections to produce stripes on knitted socks, for example. Most yarn in skein form is not long enough to achieve multiple rows of the same color. To create yarn that stripes in many rows, it has to be re-skeined to produce much longer dye sections. This can be done with a warping board for weaving looms or with specially constructed PVC contraptions. I figured out a way to create a 14 foot skein of yarn with cheap Dollar Tree door hooks. Then I dyed long sections (5 feet or so) as well as shorter sections to create multiple rows of the same color with spots of contrasting dye in between. 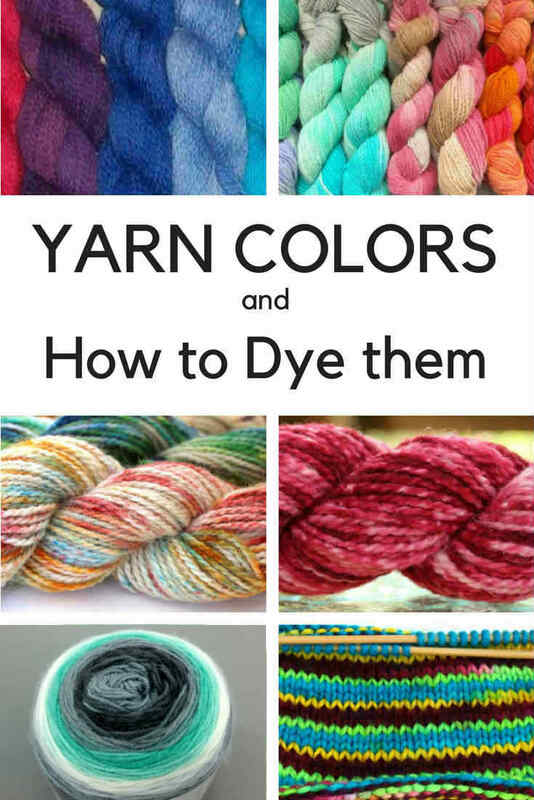 I hope this tutorial explains the basic differences between these various yarn colors and the yarn dyeing techniques to dye your own art yarn. Check back in for my Immersion Dyeing and Gradient or Ombre Dyeing Tutorials.